San Francisco Decorum's new items and acquisitions including a psyche by Jules Leleu in amboyna burl, various Muller, Degue, Schneider, Rethondes, Daum, Le Verre Francais and other chandeliers, French Art Nouveau whiplash table lamp, wrought irons table lamps, Rosewood Art Deco Desk, Rosewood Cabinet/Bar, 8 rosewood chairs, Georg Jensen sterling bowl by Harald Nielsen, Sterling serving utensils by Georg Jensen etc. Just how "new" these listings are -- well, that's another story! I mean, you have to remember, there's nobody but little old MOI doing the buying, the selling, the restoring, the accounting, the golfing, the soaking in long hot baths and playing the bridge that screams to be played. At least I've recently marked which items are sold and which are still available; that's something, n'est-ce pas?! (1) Here's something you won't see every DECADE! Or maybe even more than once in a lifetime (and this might be it, so take a deeeeep breath!). Des Hanots brings us this mind-twister, a six-pointed "hexopus" -- all one piece of glass!! Six bulbs in the middle, too! Yeow! 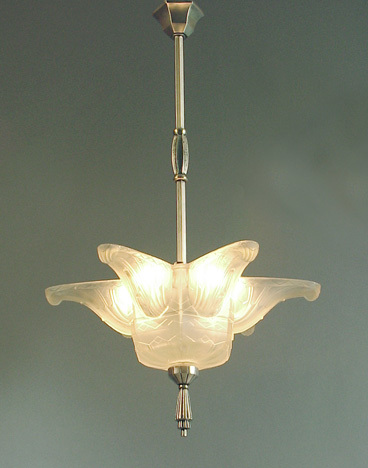 The 29 inches of length includes that bold and gorgeous finial. 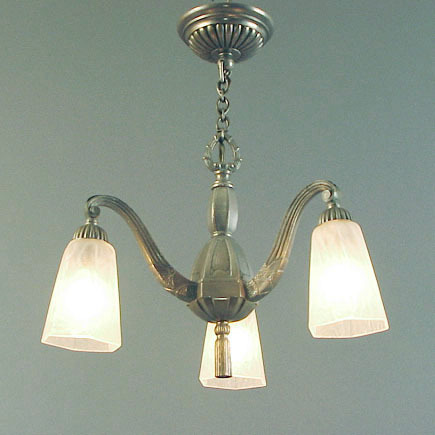 Just replated in your favorite finish -- satin nickel! 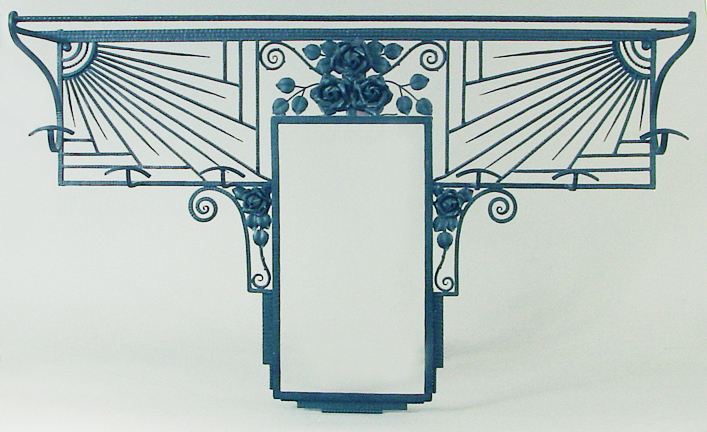 (3) A totally FAB French Art Deco display device, with three glass shelves (adjustable up and down) measuring an ample 48 inches across; the shelves themselves vary in size, from about 8 to 11 inches deep, and are a serious 5/8 inches thick! The whole affair stands about 31 inches tall, and bolts onto a table, your floor, whatever... French Art Deco display at its finest, with chromed hardware (over solid brass, 'natch). Suitable for your most revered collection! 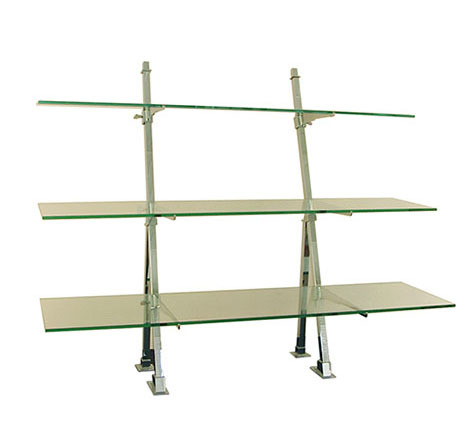 I have another, almost identical, with just two glass shelves. Ultra-ultra rare! (4) Here's a super-rare bird, a very large wrought iron "wall tree" as I have dubbed them. This total KILLER measures no less than 45 1/2 inches across (!!!) and 29 1/2 high. Yikes! Got restaurant?! I've had a beveled mirror fabricated for it (not shown) and it will gleam like a diamond when installed. Check out this page to see my many unique and gorgeous wall mirrors! (6) About seven inches of pure zig-zag on brushed nickel bronze bases! 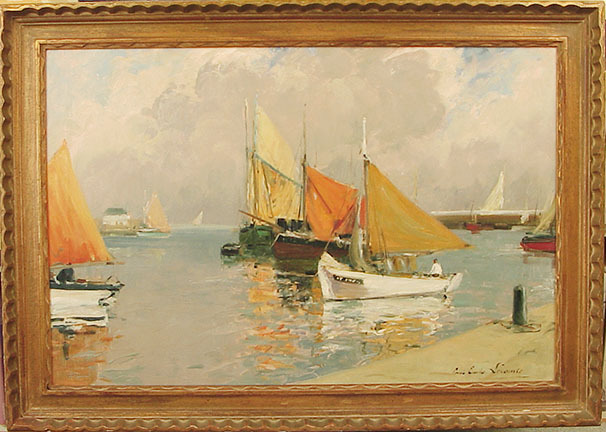 (7) Then there's my new FINE ART collection, including paintings such as this dazzling Mediterranean harbor scene by Paul-Emile Lecomte, Dutch and Italian (and other) old master paintings by the likes of Coccorante, Donducci, Wolfsen. Yeah, yeah, I know, what does this have to do with ART DECO?!! 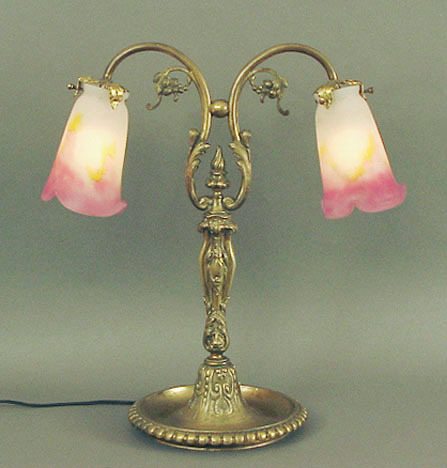 (9) This solid brass French table or desk lamp probably dates from around 1910, another example of "old world" quality so seldom found these (pitiful) days. 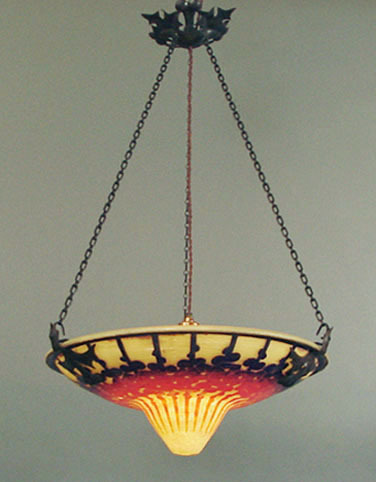 Hand-blown signed Muller shades, in particularly vibrant and rare colors, complete a picture of grace and beauty. 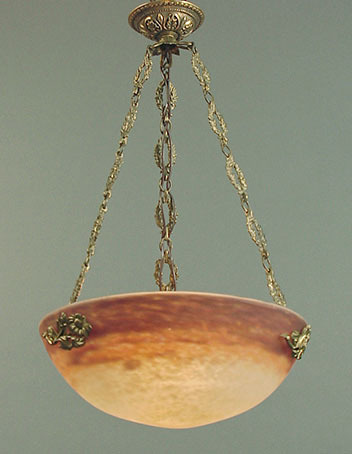 The lamp's about 19 inches tall, about 18 wide, and the base a full 9 inches in diameter! Yes, it's far too heavy for the cat to knock over! (10) Fresh off the plane and safely through the jaws of La Poste and USPS, this petite Muller bowl (12-inch diameter, ideal for a small room or entryway) has extremely unusual and beckoning warm colors. 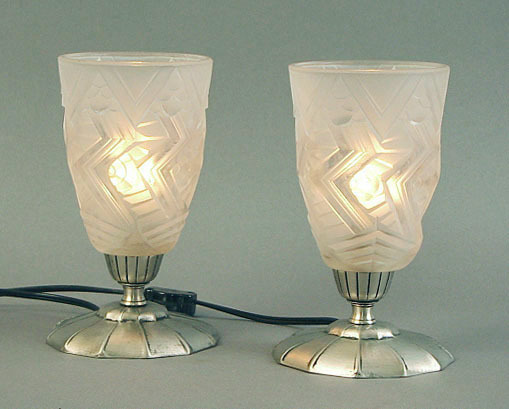 An extreme rarity: the interior is coated with a layer of opalescence, which makes the bowl positively glow when lit. The bronze and brass metalwork went out the door on an alabaster bowl, but another equally delicious mounting is available! It hangs at about 20 inches long. 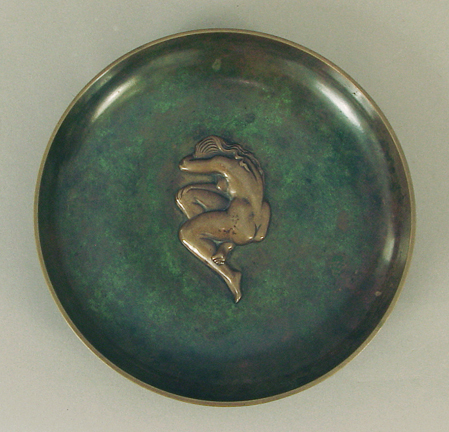 (11) Here we have an arresting bronze bowl by TINOS, a Danish artist. The bowl's just over 11 inches in diameter and weighs... 7 pounds!! In near perfect condition, just a couple of small blemishes on the verdigris patina, one at 12 and the other at 4, which you can barely see here. Signed on the back. 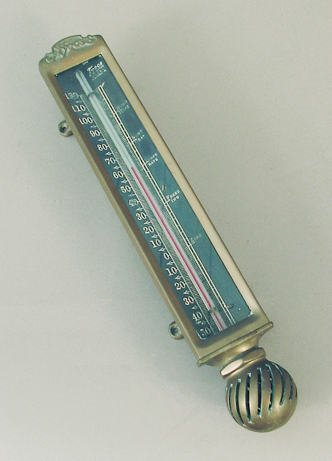 (12) And here's a totally fabulous Canadian-American item, a bronze (or brass) thermometer from the ... 20s... or earlier? The script announcing the firm, Tycos, suggests Art Nouveau (and hence earlier) styling. Are you ready for "blood heat?!" I am! It measures 16 inches long and about 2 3/4 wide. A Canadian-American tour de force, non?